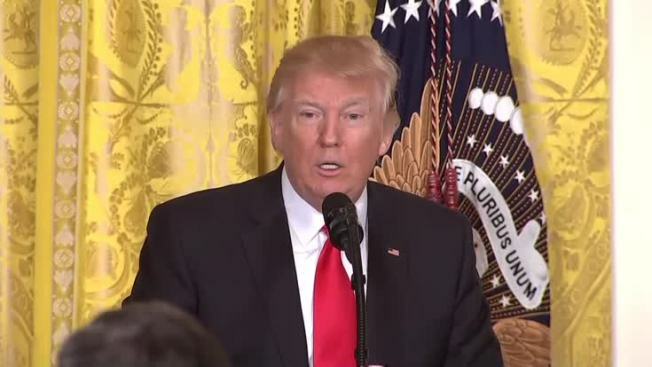 President Donald Trump wasted little time at his Thursday news conference getting to one of his favorite subjects: bashing the "fake news media." But Trump did take a moment to single out one example of an organization he believes is doing it right. "I watched this morning a couple of the networks. And I have to say, 'Fox & Friends' in the morning, they’re very honorable people. They’re very — not because they’re good, because they hit me also when I do something wrong. But they have the most honest morning show," Trump said. "That’s all I can say. It’s the most honest." Trump also addressed what he perceived to be a constantly negative tone in the media coverage about his administration. "The tone is such hatred. I’m really not a bad person, by the way. No, but the tone is such — I do get good ratings, you have to admit that — the tone is such hatred." Addressing a reporter from CNN, a frequent target, Trump lambasted the network yet again. "You look at your show that goes on at 10 o’clock in the evening. You just take a look at that show. That is a constant hit. The panel is almost always exclusive anti-Trump. The good news is he doesn’t have good ratings. But the panel is almost exclusive anti-Trump," he said. "And the hatred and venom coming from his mouth; the hatred coming from other people on your network." Trump also had a tense exchange with NBC News' Peter Alexander, who challenged the president on his false claim that he had the biggest Electoral College victory since Ronald Reagan. “You’re the president,” Alexander responded. Despite his constant criticism, Trump did admit to being a faithful CNN viewer. "I watch it. I see it. I’m amazed by it. And I just think you’d be a lot better off, I honestly do. The public gets it, you know. Look, when I go to rallies, they turn around, they start screaming at CNN," he said. "They want to throw their placards at CNN." At the same time as Trump was lambasting the media, CNN President Jeff Zucker said that his network's brand "has been as strong as it has ever been," The Associated Press reported. He said an internal study he ordered to find out if Trump's "fake news" label had sticking power found that less than a third of 2,000 Americans surveyed believed CNN's Trump coverage was unfair. Trump did make one concession during the news conference. He would stop addressing the media as "fake news." "I’m changing it from fake news, though," he said. "Very fake news." On Thursday, the Trump campaign released a "Mainstream Media Accountability Survey." The statement accompanying the survey said "You know that I don’t trust the media to report on anything we achieve." "You are our greatest asset in helping our movement deliver the truth to the American people. Which is why I need you to take the Mainstream Media Accountability Survey to do your part to fight back against the media’s attacks and deceptions." Trump tweeted Friday afternoon, calling the media "enemy of the American people," and mentioning The New York Times, NBC News, ABC, CBS, and CNN. The tweet comes after he tweeted a similar tweet saying "The FAKE News media (failing @nytimes, @CNN, @NBCNews and many more) is not my enemy, it is the enemy of the American people. SICK!" and then deleting the tweet immediately.